In most Asian household fish paste is normally bought from the fishmongers because it is presumed to be a laborious proposition to make at home. In fact there are many specialty stores in Asian cities offering only fish paste and fish balls. These stores are often known for their own signature variety of fish paste or fish balls. But it’s surprising to know how easy it is to make fish paste at home. Before the advent of mechanized processing, fish paste (魚漿) was made in large mortar by smashing the ingredients with pestle. 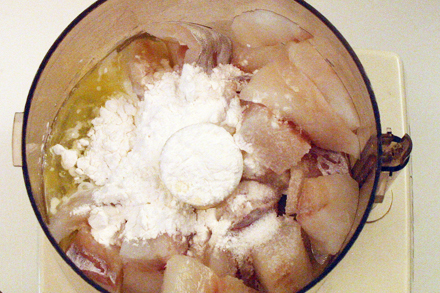 White fish is smashed until completely disintegrated, and then egg white, starch and seasonings are added. Occasionally you can still find a traditional fish paste store using these ancient tools. Now though, we can make fish paste successfully in the home kitchen using a food processor. To make fish paste, select white fish with very firm meat. I like to use pollock or cod. Along with good arrowroot starch they make excellent chewy fish paste. I strongly suggest you get arrowroot starch for this recipe and not cornstarch. All ingredients should also be kept at a very cold temperature. In this recipe I suggest the use of ice cube during blending to keep the temperature low. Once created the fish paste can be used in many different ways. It can be used to stuff eggplant, bitter melon or other vegetables, made into fish balls, or formed into cake and deep-fried. You can even drop lumps of the raw paste into soup or a hot pot. 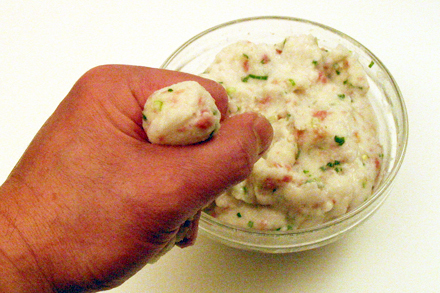 To form fish balls put a handful of the paste in your palm. Then make a circle with your index finger and thumb. With your other fingers squeeze the fish paste through the hole, and squeeze your thumb and index finger together to slice off the ball when it’s the desired size. We enjoyed this fish balls during our Chinese New Year hot pot dinner. I added ham and chopped scallion to make the dish more interesting. I also made a shrimp paste by substituting equal amount of shrimp for the fish in the same recipe. I hope you’ll enjoy it as well. 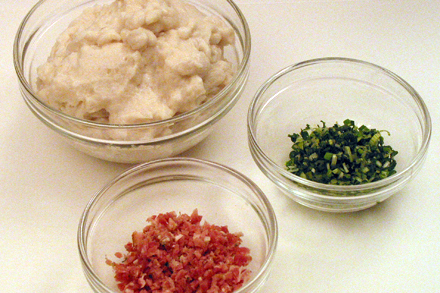 Add the ham and scallion into the cold fish paste and be sure to mix very well. Then form the fish balls and put them spaced evenly on a flat tray. Cook the balls in boiling water for about three to five minutes depending on the size of the balls you formed. Set aside for used in soup or in hot pot. Oh wow, thank you for this. You know, it really is funny how some foods can seem super complicated until you understand them. Excellent instructions. 😀 Definitely going to try this. I’m starving! I visit your blog and I can’t believe how hungry I get! I may even give these a whirl. Happy anniversary Kian! Thank you for this post. Very simple and yet tastes so good. I must try your recipe… I haven’t make any fishball in my lfe 🙂 It’s ashamed, I know but it’s never too late to try it out ain’t it. There’s a noodle seller in my hometown that uses Eel to have this silky texture. They are famous and people (even in Merz) as far across the borders came to eat their noodles and their homemade fishballs. I read somewhere, they even exported their fishballs. Some of my expert ‘Aunties’ said you must have bouncy fishballs to prove it’s delicious LOL. As a child, I always imagined those fishballs bouncing and flew everywhere when you tested for their bounciness and worthiness to eat. Even today, before I eat any fishball, squid/fish balls or meatballs, that’s what am looking for. Do you know the white fish in Chinese? Take a look of it. Maybe you can think about it to have that in your website. Peiling, Pollack belongs to the cod family of fish. In Chinese it is called 綠鱈. I’ve also considered cookbook printing services, but have yet to decide whether to sign up with any of them. Before I try your recipe, I just want to know why does it require 3/4 lb of chinese brown sugar? Will the fish paste be very sweet? Ooops! I have to apologize for the mistake. The brown sugar has no business to be in that recipe. Thank you for pointing that out to me. I’ve removed it and the recipe as it appears now should work. Thanks. your help please…this fish paste receipe you have posted, can it be used to deep fry up into the Korean street food know as Hot Bars…other name I have heard it could be is Kamaboko…..any input would be helpful. Yes, you can fry the fish balls made from this recipe. Do boil the fish balls until they are cooked through before deep-frying them. Enjoy! As it is, my parents hardly speak any English and much to my lack of foresight, I don’t read/write in Chinese…so…I have plenty of great memories of food, and can usually taste ingredients….and fish paste is something that I’ve been unable to make (nor find anywhere but at my parents)…I’m going start working on this soon!! Thank you for the recipe. I am in a region where there aren’t many Chinese people, and so there is no specialised grocery carrying fish balls. For sure I will try the shrimp balls. One restaurant in Montreal makes jiaozi with a type of shrimp paste and fresh cilantro, and I’ve meant to replicate (*ahem* improve *cough*) on the recipe for a long time. i have been searching for recipes/tips on how to make ‘bouncy’ fish balls, but have not been able to replicate the ‘bounciness’ of commercial or hawker stall fish balls in singapore or malaysia. i believe the type of fish used is very important – and as i understand in those countries its mostly spanish mackerel(tenggiri), which is not available in netherlands except as expensive frozen steaks. Frozen fish have too much water in them, even when i ‘drip dry’ them in the fridge, and therefore i do not add the ice cubes. I put all ingredients (including the starch) in the fridge for at least 1 hr before blending. i think cod will be too flaky and not firm enough, i have tried pollock, but i can only get the frozen steaks and they do not work well. the fish types that i have better success is what is sold here as ‘lake victoria bass’ which is actually a giant fresh water perch. Tilapia also seems to work OK, except that i prefer salt water fish. any tips on how to improve the ‘bounce’ of fish balls? Hi jsager, You’re right that certain fish are better for making fish balls than others. I would look for fish with firm meat. Personally I think pollack works very well. The starch is also a very important ingredient for the “bouncy” texture. I like to use arrowroot starch. I think it does create a better texture. Adjusting the amount of egg white and starch can vary the texture. So I recommend that you experiment with their proportions. thanks a lot for this amazing fish paste recipe I tried it today it was fab…. made it balls then fried it and serve it with sweet and sour sauce ….it was sooooooo delish and so easy …. Hi Kian, thanks for the recipe. My little one loves fish balls so hopefully my attempt will be successful and don’t have to buy the store ones anymore! Can you let me know how to freeze the fish balls for later use? Yes, fish paste is actually quite easy to make using food processor. You should only freeze cooked fish balls and not the raw fist paste. Frozen fish paste does not retain the same texture after thawing. So I suggest you make all the fish paste into balls. Cook them then cool them before freezing. Enjoy! Tilapia cultured in ponds is usually of small size and its acceptability is not good in Uganda as people are used to these big naturally grown wild tilapias. As an result many farmers have abandoned there ponds for other enterprises. Can i make fish paste from these small tilapias in order to help create market for them and help put a smile on faces of these frustrated farmers. You can definitely use any tilapia meat for making fish paste! the ingredient list is great. egg white and starch does contribute to gel strength of the surimi (that is what you are making after all). but there are 2 omissions, one is that you have to set the fish paste after shaping. depending on the fish species, this is at about 50 degrees celsius for 30 minutes. Also the salt content should be closer to 2% of total weight. Thank you for the tips! I will have to experiment with your suggestion. I’ve always just boil the fish balls to set the paste after shaping. Or if using the paste for stuffing I’ll just cook after being stuffed. are you sure it is 50 C for 30 minutes? that practically cooks it thru. I have heard of it being kept in the freezer or fridge for sometime, but never at +50C, if the intent is to set it. Anyone tried this 50C for 30 minutes? I must admit I wonder about this temperature as well. Perhaps it is 50 F. But even at 50 F I think it is a bit high. We should always keep food below 40F when holding or setting. Hello, I am glad I found this recipe! I am actually a Black woman who was raised on the North side of Chicago, so at a young age, I was exposed to many different cultures. One of my best friends Ala was the son of a Chinese restaurateur when Food was done in the true Asian style(early 1970’s). I haven’t been able to find anyone making fish balls near me in these homogenized southern suburbs. Hey, when your mom is a teacher in School where there are 22 different dialects, your palate gets braodened “smartened up” early on !I am so glad to find your blog, and in particular this recipe! Thank you so much This is especially helpful to me since im making major dietary changes for health reasons. i found this only today.i used a food processor as i do not want to strain my hand and shoulders doing the traditional beating to make it “springy”. I used Ling fish instead. it took a while to boil the fish balls.do i put in fridge for 1 hour before I make it into balls? tks for this recipe. does it matter egg yolk or egg white as i saw else where 1 egg? Thanks for visiting Red Cook and commenting. I would suggest you only use egg white when making this paste. The yolk will make the paste yellow and will also change the texture of the finished product. Refrigerate the paste uncooked for about an hour before making them into balls. Fish balls of about one inch diameter should only take 15 minutes or so in boiling water to cook through. Very good recipe! I made it for Winter Solstice hot pot dinner. Everyone thought I was a great chef for making perfect bouncing fish balls. I follow your recipe exactly. I used True Cod. I live in Seattle so seafood is always plentiful. A week later I used cornstarch because I ran out of arrowroot, big big mistake. It was nasty. I have a question: if I make the paste, can I keep it refrigerated and use it when I want to for the next three days? Thanks for your kind words and I’m very glad you enjoyed the fish paste recipe. Yes, you can store the paste in the refrigerator for two to three days. If you wish to keep it longer I suggest you make fish balls and cook the paste. Then you can freeze the fish balls for later use. 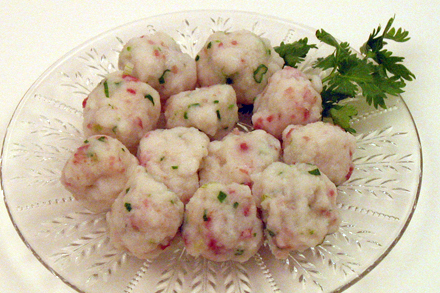 Frozen fish balls maintain their taste and texture for a few months. I am just wondering if instead of using ice cubes, can i just use frozen fish since that is what I am able to find most of the time anyway. I just tried a recipe using frozen cod and it worked out terribly. It was not a paste but more like fish flakes. I should’ve known as the ingredients did not include eggs and did not include enough starch. I also used frozen fish (cod) so maybe it had more water than fresh fish? I also bought tapioca starch just for the recipe. However, after reading your recipe I think it makes much more sense. But now I am stuck with using the tapioca starch. Would I need twice the amount of tapioca starch? (1 cup) or should I keep (1/2) cup per your recipe? since I found online to substitute 2 tbsp cornstarch for 1 tbsp tapioca.Thanks. I really wanted a recipe that works. Also I assume these can be made into fish cakes by pan frying?? You can use frozen fish if it is already cut into small enough pieces to be blended in a food processor. 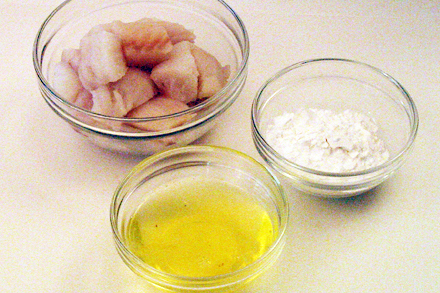 Yes, you will need the egg white and the starch to bind the pulverized fish. The purpose of the starch is to bind the fish and you can use the exact same amount of cornstarch to replace the tapioca starch. But I do highly recommend using tapioca starch. It can be found in many natural food stores.